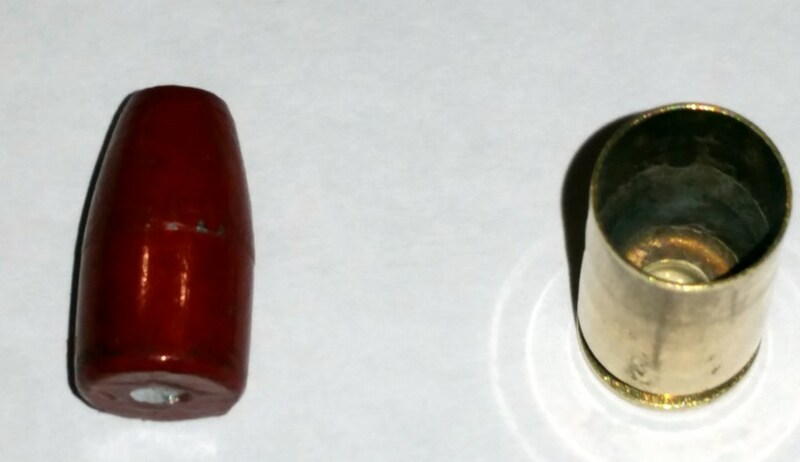 For coated bullets (acme lipsticks, blue bullets, etc), I would pull one and check the crimp. In my experience with them, you have to use a light crimp or the coating beneath the crimp line will sheer off on firing (or pulling). Some coated bullets need a crimp that is about .01” beyond just removing the bell added to allow bullet seating. When I pull a coated bullet, I want to see just a really light line around the bullet in the coating. If it looks like a very defined, deeper ring into the coating, I back it off until it is a faint line. I will add a pic of this when I get back home. If you see specks of color from the coating in your machine, it usually means you need to slightly increase the bell of the case mouth before seating the bullet. Additional note on crimping: Berry’s plated bullets also require a light crimp or you will get some bullet deformation and end up with paper plate sized groups at 25 yards. From what I had read, I also saw that you don't want to over crimp the coated bullets. I kept the crimp on the light side based on the setup instructions with the Lee dies. When I was testing the press setup, I made up a few rounds with no powder. I took one, drilled out the primer pocket, and punched out the bullet pretty much straight out of the case. There was a tiny nick in the first picture. That's pretty much all I could see. What are your thoughts? @Weapon So I readjusted the press to have a COL of 1.135". I didn't have any loading issues at 1.10" so the longer length should make misfeeds a non-issue. From what I've read, shorter lengths are more accurate. The loads I tested were plenty accurate to 20 yards, so the 1.135" should be a good compromise. I tested the original 1.10" rounds in the gauge and in my barrel without any issues. The 1.135" was fine also. I made a 1.140" to test fit and it was fine as well. I'll make 20 with a COL of 1.135" and test them out. I think I'll load 10 with 3.0g and 10 with 3.1g of Titegroup and see what I get on the chrono for PFs. Trying to keep it between 128-130. From what I have seen, most Caniks will let you load really long (that isn’t a complaint). I haven’t had any noticeable decrease in accuracy from loading slightly longer - I have tried a few out to 1.152-1.153” with no problems but definitely plunk test several of those if you go that long just to make sure. Once you get to the put of bullet contact with the lands, pressure jumps considerably but the plunk and spin test will let you pick up on that before you try to send one downrange. That pulled one looks about right. When you pull them, you are always apt to get the bullet a bit cockeyed on the way out which can cause a scrape on one side or another. So long as the crimp line is fairly faint, they should be good.